Zooniverse is back in print!! Here is the cover which is artwork I did back in 1986 while still working on the original series. The Zoonimini's are intended to pave the way towards the 200 page collected album of the Zooniverse series! They will elaborate on concepts I was unable to cover in the series. This first issue reveals the Animoid Rimworlds in relative position to the Hub for example. 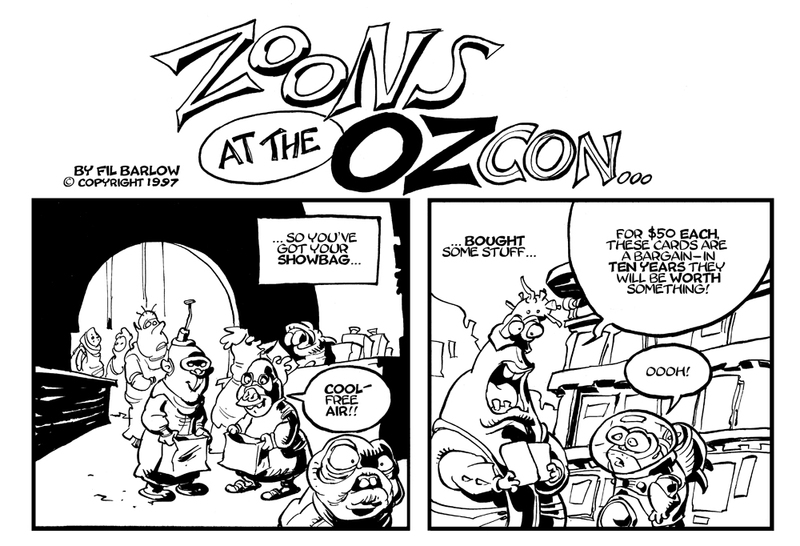 Also included is the comic story "Zoons at the Ozcon" which was included in the program given away at the 1997 Australian Comic Convention held in Sydney. 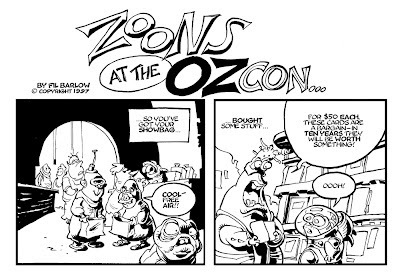 "Zoons at the Ozcon" is a very biting commentary on the activities of earlier OzCons that I had attended. 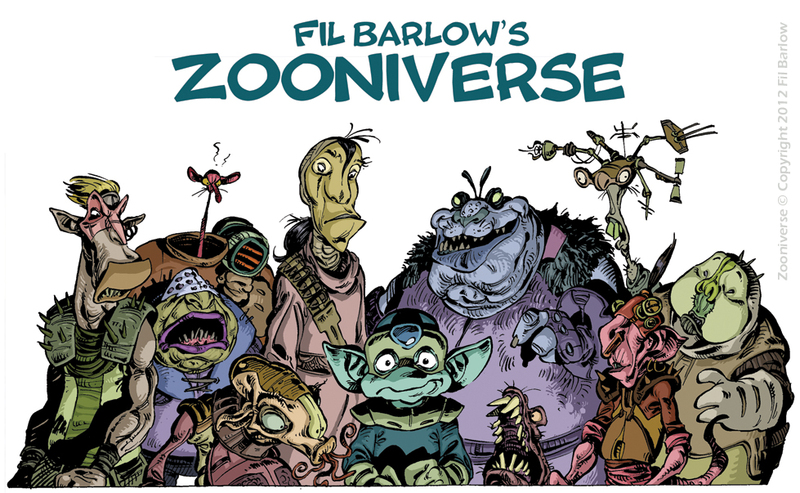 Not much has changed so it seemed more than fortuitous to relaunch this comic, fifteen years later, at the first OzCon to be held in Melbourne. Included in this story is a timeline summarizing most of the animated shows that I've been Lead Character Designer on. The left page below was from the original comic, but I've created a new page that updates the timeline to include shows after Extreme Ghostbusters. Our intention with this first issue was to introduce a new readers to my work both in comics and animation. With subsequent issues of Zoonimini's we hope to put all Zoon related material into print most of which was never seen beyond the shores of Australia. Will any US comics distros be carrying this? Damn! Just today I received my copies of the first two issues of the old Zooniverse comics. I became instantly drawn to the artwork and story. Are they reprint the old comics or are these entirely new stories? These are new, the Zoonimini's won't have any of the stories from the original series. We are saving that for the collected edition planned to be released in a year and a half. That's cool. I'm going to put in my order now. 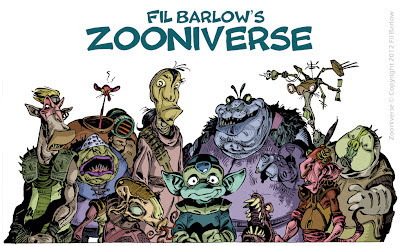 "200 page collected album of the Zooniverse series" hoo-boy, hoo-boy, hoo-boy! I cannot wait for this, Fil! Well, as you well know things are never simple, Milk Shadow Books has decided not to publish ANY more of my work (go figure). Leaving me with the responsibility of continuing solo, maybe with Image's help, but as this has been a lesson in "don't count those chickens before they hatch", I can't rely on that either (in spite of Brandon Graham's much appreciated efforts to get me a deal). Bottom line is, I'm unexpectedly looking into self-publishing which was the last thing I wanted to do. I will definitely keep you posted on that front! Yeah, get in touch with Image. From what I hear it is sort of like a self publishing deal in that there are no advances, and they don't really do much promotion, so that will be on you to do yourself, but you retain the most rights of any of the deals offered by the biggies. And their logo on the front of the book may entice some people to have a look at it who would not otherwise. PS: have you looked into INDIEGOGO as away of raising funds, via crowd-sourcing? If you go the SELF-PUBLISHING route it might be worth a go. Unlike KICK-STARTER they are set up to operate INTERNATIONALLY and also unique is the fact that you get to use the funds gathered even if you do not reach the full target amount.